Human Collections ... inspired by neighbourhood meeting places. Interface has introduced Human Connections, an integrated flooring system that promotes biophilic design by embracing nature’s elements and their relationship with interactive, gritty, urban neighbourhoods. 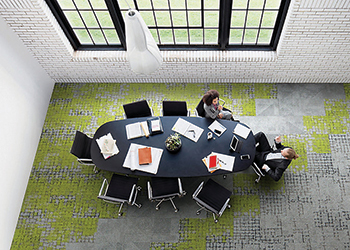 The system allows to create points of interaction and movement in the built environment that drive people to mix and mingle more naturally, says the leading US-based manufacturer of modular carpet. Interface has recently expanded into modular resilient flooring with a luxury vinyl tile line. 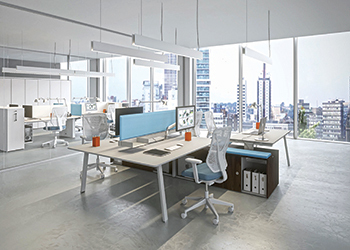 Vista Essence ... a lightweight and functional office furniture range. Newform Ufficio of Italy has launched a re-styled version of one of its best-seller office collection Vista. Vista Essence, as it is known, is a lightweight and functional office furniture range featuring a design that combines simplicity and comfort. The key innovations are an A-frame leg, in addition to the existing inverted ‘U’ structure, and an impressive colour range. Its lightness, contemporary look and elegance in matching soft-tone finishes, such as silk white and ivory grey, its amazing ‘real wood’-effect finishes such as ethereal walnut, cortex walnut and solemn walnut, and realistic reproduction of ‘essences’ are key factors that give this range its name. “The essence of Vista lies in its style and versatility in adapting to evolving business needs and the personal style of those who use the office,” says a spokesman for the company. The variety of configurations, technological solutions and the quality of materials used enhance the appearance of any office while making space management simple, he adds. Newform Ufficio is a brand produced by Aran World, an Italian export leader in the kitchens, office furniture and wardrobes sector. Calce ... a new range of shower trays. In line with its commitment to offering wellness-oriented shower solutions, Glass 1989 has developed Calce, a new range of shower trays in MineraLite, a composite of minerals and resins. 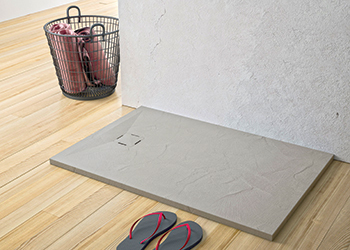 “The innovative material combines high performance with an extremely natural look, presenting an unusual surface texture that reproduces a spatulated cement effect, to give the shower tray an unmistakably tactile feel,” explains a spokesman for the Italian firm. Glass 1989 continues to invest in showering by focusing on an integrated approach, with the aim of creating increasingly tailor-made and wellness-oriented shower solutions, he says. “Major attention is paid to the versatility of the materials on offer, coming up with unusual and contemporary textures and in elegant colours, capable of effectively combining feel and style,” the spokesman points out. Calce is the ideal tray for those seeking textured and contemporary solutions for their shower, he adds. Calce is available in five colours: white, sand, concrete grey, anthracite grey and hemp, made in a wide range of sizes in a rectangular, square or semi-circular shape, which can be cut to fit during installation.